Even if you live in a warmer climate, I’m sure you look forward to the slower pace that kicks off Mid-May. It’s also the time that a lot of moms start thinking about fun outdoor summer activities to keep the kids busy once school is out. However it seems to me (is it just me??) that summer fun has gotten kind of complicated AND expensive! 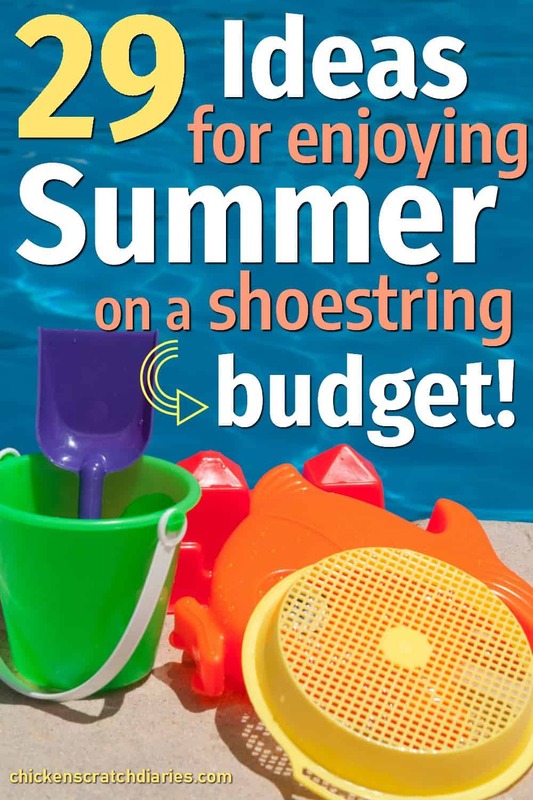 When our kids have their sights set on fancy summer camps and elaborate family vacations — it can make some of us in the gotta-budget-life camp feel a little at a loss for how to entertain them with some cheap summer fun for the next three months! We tend to play it by ear most summers. This summer, though, I’m determined to plan ahead and build some summer fun into our days so that we can make the most of this season that we enjoy so much. Let’s be real though: having a calendar full of pre-meditated activities makes my life a little easier too! While working at home, it’s easy to let FUN slide to the back burner so that I can get more done. But when I do that, it usually backfires on me: the kids get extra-whiny and in need of attention. Who can blame them? While I’m still a big proponent of independent play and teaching kids how to entertain themselves, they do need a little help coming up with ideas to keep them busy. 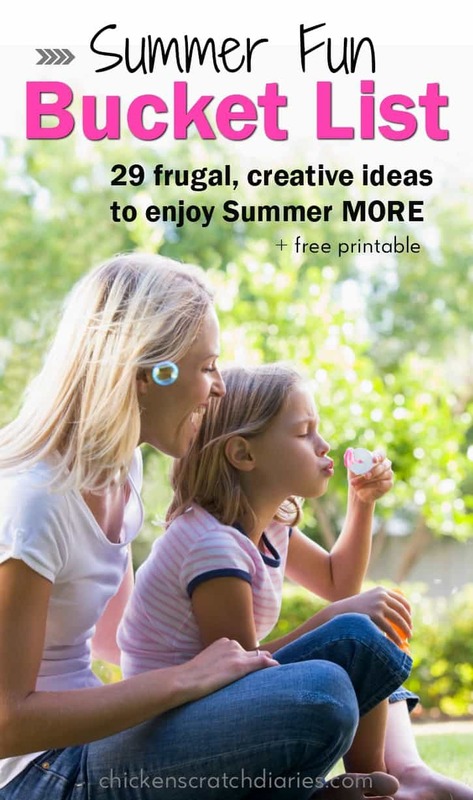 So, here are 29 summer activities to help your family make the most of summer! #1. Water balloon or squirt gun fight! #2. Sidewalk Chalk. My older kids STILL love sidewalk chalk. #3. Play in the Sprinkler. #5. Build an outside fort with lawn chairs or clotheslines and sheets. #6. Have an outdoor movie night with a projector (borrow one) and a sheet. Or, visit a drive-in movie if you have one nearby. #7. Go on a nature scavenger hunt. #8. Visit the pool. Ours has half-price days so we plan ahead for that! #9. Visit the Library. Check out books, enjoy storytime and enroll in summer reading programs if your library has one. #10. Take a trip to the ice cream shop. We prioritize this in the summer! We have a local soda fountain that features super-cheap ice cream cones; or visit a chain restaurant such as Steak and Shake at “happy hour” when shakes are half-price. #11. Visit a local park or conservation area and take a hike as a family. Older kids can videotape and narrate the experience. #13. Visit local beaches / lakes. #14. Visit the zoo. Check their website for discount days – ours has a few days each month in the summer. #15. Make a summer scrapbook. Younger kids can color pictures and you can add photos to their books, or items from scavenger hunts. Older kids can get more creative or create a digital version! #16. Outdoor family games at sundown (when it’s cooler out): Badminton, volleyball, Wiffle ball, kickball, basketball, tag, flag football. You can wear glow stick bracelets when it starts to get dark out! #17. Plant a garden and harvest crops. Container gardens are a great option for just about everyone and are much less maintenance than the old-fashioned route. Bonus: Kids who grow veggies are more likely to eat them too! #18. Have a picnic lunch (or dinner al fresco). #19. Have the kids write their own play and perform it for after-dinner entertainment on the lawn. #20. Camp out in the backyard. #21. Have a bonfire & make smores. #22. Visit a local farm and pick berries or learn about farm animals. We’re pretty blessed with a variety of these in our area! #23. Ride bikes or go for a walk. #24. Make your own DIY bubbles & have a bubble-blowing contest. #25. 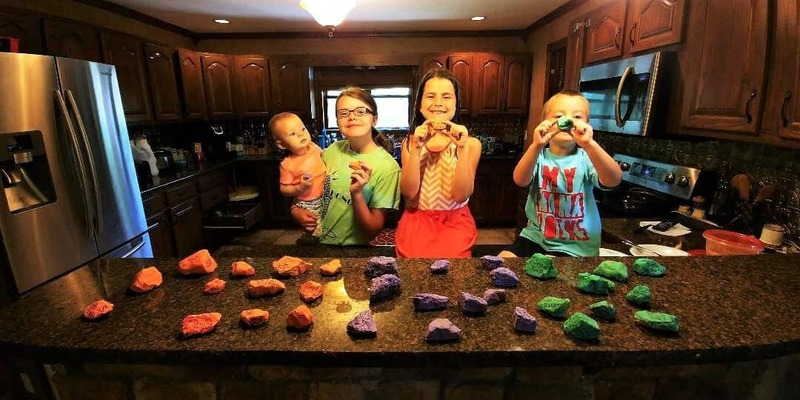 Let the kids paint rocks outside with $0.50 craft paint. 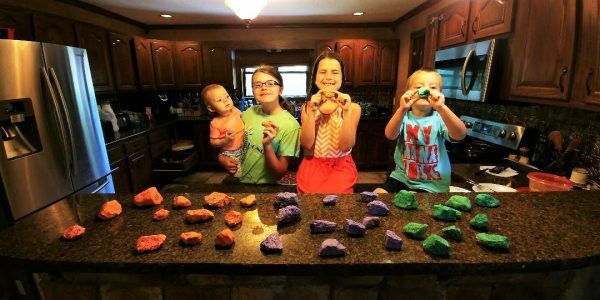 We did a fun missions activity with “Jesus Rocks” last summer that the kids LOVED. #26. Fly kites. Older kids can make their own with this tutorial. #27. Plan ahead for local festivals (apple festivals, etc) or parades; many include free activities, bounce houses, live music, fireworks. Your local Chamber of Commerce may have a calendar of events you can check out. #28. Make a backyard obstacle course. Email subscribers can receive a printable version of this list. See the box below! Thanks Sabrina! Glad you found it useful!